The shifting focus of European countries toward energy efficiency is certain to act as a driving force for Europe residential boiler industry. The increasing awareness about the adverse effects of fossil fuel consumption for energy generation has been encouraging most of the European countries to adopt zero emission energy facilities. In fact, several countries in EU have already been following established energy efficiency legislatives to promote the use of renewable energy facilities across the residential sector, thereby stimulating Europe residential boiler market trends. The deployment of energy efficiency legislatives is bound to help the continent balance the increasing fossil fuel-based energy consumption which led to a major rise in the levels of carbon dioxide. For the record, in UK, the domestic sector accounted for 28% of total energy consumption in 2017, out of which most of the energy was used for water and space heating purposes. Thus, in order to comply with the deployment of energy efficiency measures, most of the masses have been installing more efficient boilers and renovating existing home insulations. The surging awareness regarding the benefits of efficient boiler installation is thus poised to boost Europe residential boiler industry share. Energy giants partaking in Europe residential boiler market have come to shift their focus toward the development of high quality and efficient products. In accordance, several countries have taken initiatives to support product manufacturers by providing them with the required financial support. Validating the aforementioned fact, recently, London’s Mayor unveiled a GBP 10 million scheme to improve the capital’s air quality and encourage industry contributors to replace traditional and inefficient boilers deployed in residential sector with energy-efficient, advanced models. The development of energy efficient boilers could save a huge amount of money from energy bills. Moreover, the UK government is planning to make London a zero-carbon city by the end of 2050. 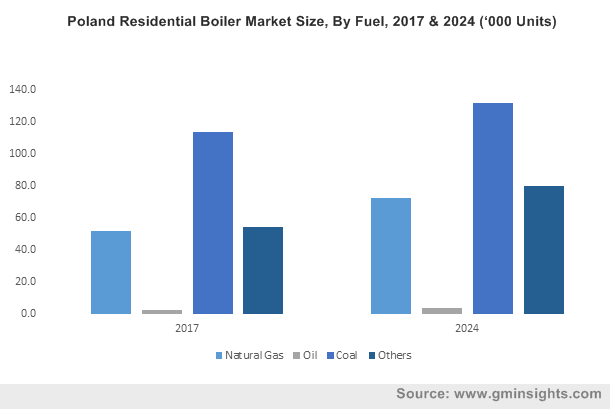 The collective efforts of the regulatory bodies and regional governments are thus poised to impel Europe residential boiler market size over the years ahead. Speaking more about the energy efficiency scenario across UK, it would be prudent to mention that residential building owners are also looking forward either to install new boilers or to refurbish existing boiler systems, positively impacting Europe residential boiler industry share. Incidentally, in the UK most homeowners are now investing heavily to upgrade existing boiler systems in order to comply with energy rules. Seemingly, more than 35% of landlords have replaced old boilers with new ones. The shifting trends toward replacement of traditional residential boilers with modern boilers will have a considerable impact on UK residential boiler market which will grow at an annual growth rate of more than 2% over 2018-2024. The regulatory norms set up by the regional governments have also been having a positive impact on Europe residential boiler industry giants, encouraging them to develop energy efficient, compact, and cost-effective heating systems. In accordance, most of the boiler manufacturers have added newer product lines comprising compact and high-efficiency boilers. The addition of new manufacturing lines among an already established product portfolio may emerge rather beneficial for local end-users, owing to their easy availability. The adoption of novel growth tactics could thus very well boost Europe residential boiler market over the years ahead. The decarbonization strategies adopted by European countries for maintaining energy efficiency and reducing energy costs for consumers will have a favorable influence on Europe residential boiler market outlook. In addition, the ongoing renovation of existing residential boiler systems will also generate lucrative opportunities for the service providers in Europe residential boiler industry. Driven by the increasing benefits of installing energy efficient boilers and a supportive regulatory spectrum, Europe residential boiler market will surpass a valuation of USD 6 billion by the end of 2024.